Bryan Miller has been making sense of financial statements for over 10 years. He’s worked at Morgan Stanley on the Options Desk, Hapoalim Securities on the Fixed Income Desk, and done financial consulting for small-and-medium sized businesses based across the globe. Whether it’s working on a trading desk, in the classroom, or in the Board room, he’s equipped management teams with the necessary tools to make sound financial decisions. Apart from finance and accounting, Bryan has worked extensively with students, athletes, and teachers to develop stimulating language and development courses in Seoul, South Korea, at RomAltruista in Rome, Italy, and at The Door in New York City. Empowerment through education has been an important avenue Bryan wishes to open for more women, girls and boys around the world. Bryan ultimately joined ICAAD after living on three continents, seeing first hand the gaps in educational, social and legal systems. Bryan felt joining an organization that has a global perspective, with clearly defined programmatic focuses which sets out to impact entire countries and regions, would continue opening those avenues to help empower individuals on a larger scale than he could do himself. 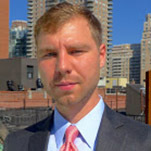 Bryan graduated from Pace University in New York City with a Bachelors in Finance and has taken courses towards a Master’s of Science in International Banking and Finance at the University of Rome, Tor Vergata. He currently lives in New York City. Bryan served as Treasurer on ICAAD’s Board of Directors from 2014-2016.